EXCITING ♣ INCREDIBLE ♣ AWESOME!!! I am still feeling all of these at the same time at and from our Chicago St. Patrick’s Day Parade. The Corps’ day ran as smoothly as a mid-tour contest day. Clockwork, Schedule Awareness and the high spirited 50 plus people clearly exhibited the purpose of being, “Better Every Day!” If you missed this, I feel sorry for you. It could be said that it was an experience of a lifetime! WHAT A BEAUTIFUL DAY TO BE IRISH IT WAS! We started the day in sunny weather and left early after a breakfast of “Green Doughnuts” and “Orange” Sunny Delight. The day wouldn’t be right without some challenges to be met. Challenge #1: The O’Hare Oasis is gone!!! It is torn down and most likely will be reconstructed. But a trailer marked, “Bathrooms”, helped to solve this most needed challenge! There were lots of cars at the mall parking lot and on schedule! The rehearsal time was well spent. The 22 brass sounded awesome! They led by Dr. Cecil Austin and Randall Bennett. The percussion led by Andy Stawick #1711, Nick Fugh #2213, and Jen Tarka#1777 plus many other new recruits from Milwaukee’s Marshall High School did a remarkable job of coordination. The tempo was strong and everyone finished the parade (even the (ageless age-outs!) Our guard was small (5) but very talented. They were led by some dedicated vets including Jalissa Bishop #1815, Lisa Janasik #1881, and Ronald Raymond #2491. They put on a great show! The brass were the showpiece. There were 7 mellophones and some strong squealing lead trumpets that have “Garry Owen,” a bone-chilling ending. Our Drum Major for the day was Jessie Marsala #2208. This former Pioneer drum major has not lost her touch! She looked military clean and kept the corps steady on the street. Josh Pier made our traditional diamond parade formation look precise which added to the solid sounds helped by our talented veterans. After the parade, former Drum Major Jackie Bilder#1787 invited everyone to her bar/restaurant, Natural Law in Blue Island, Illinois for a get-together. She made broasted chicken and spiced potatoes, as well as home- made Green shakes for all. A big surprise was that Jackie had an Irish folk band who created mind-boggling volume of sound (Loud is Good!) Right  The party concluded with a presentation plaque to Roman, Sue, and Murray for all they do/have done for the corps, past, present, and future. Jackie also gave an unexpected huge, fragrant, bouquet of flowers to these unexpected and very appreciative people. It was awesome and heartfelt to have members of the Pioneer Family come from long distances to once again be with their Pioneer brothers and sisters. Randall Bennett drove all night from Albany, NY. Amber Heidenreiter #2483 from NY, Lance Reisetter #2352 from Oklahoma, and Jessica Neises #2914 from Kansas. My apology if I have missed someone! Please say an extra prayer for our famous cook extraordinaire, Daphne Allen. She was involved in a serious auto accident and will be going for surgery to repair her right arm’s rotator cuff. During St. Patrick’s week, Pioneer sponsored all of the pizza for the monthly meeting of Chicago’s Olde-Time Corps Veterans. Besides, great fans of the pioneer Corps, occasional $$$ sponsors, and most importantly these drum corps vets are the keepers of the spirit of drum & bugle corps as a life commitment. Credit for this 276th consecutive Tuesday night get-together goes to Mr. Ami Menie and Fred Schroeter. Both of these gentlemen marched in the Chicago Royal Aires Drum and Bugle Corps. 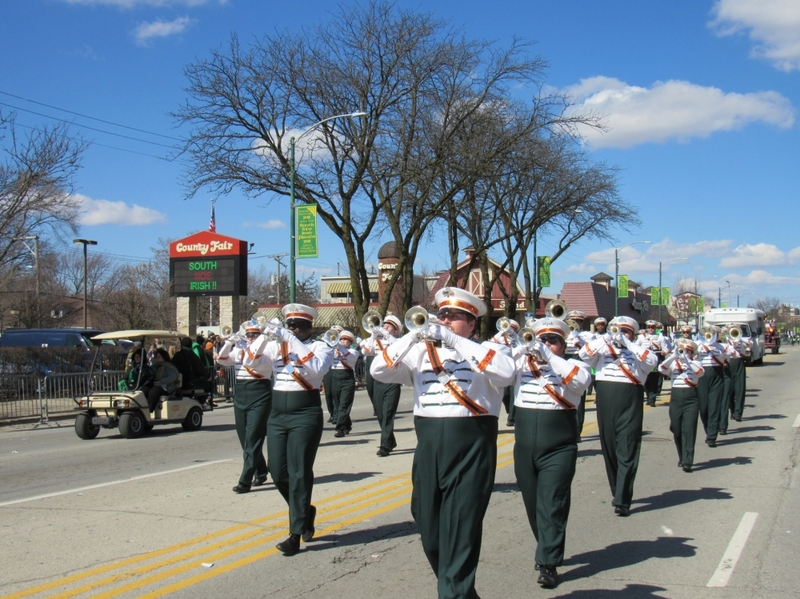 Fred goes back to the Austin Grenadiers and Skokie Indians, all Midwest Chicago area corps of the past! The list of 17 ideas for Pioneer to do this summer and future will be paired down shortly as discussions for Pioneer Power will be made…. Thank you so much to many adults who came and helped the Corps look so good and perform flawlessly. The Uniform Fitters, Bus Drivers, and Equipment Distributers. While there was no cooking involved, the cooking helpers carried the banner and American Flag for the entire parade! Yes, Pioneer Pride is strong and deep….more to come! Pioneer Corps Jackets are being mailed out this week! Finally we found a new source to continue our 58 year old traditional bright Kelly Green jackets. This was quite a challenge, but we persevered….and succeeded! Please take a few minutes to read below the information as to how you can get good products at good prices, and help The Pioneer Corps at the same time. All of the items on the regular Amazon. Com you can get here at smile.amazon.com. Try it out and help your Corps! HAPPY SPRINGTIME AND BETTER EVERY DAY!